The film centers on Freddie Mercury (Rami Malek), a young musician at heart working at Heathrow Airport. Often at odds with his father, Freddie dreams of something more than handling luggage. 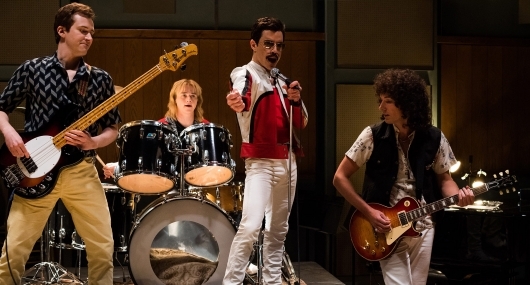 One night he crosses paths with his future bandmates, guitarist Brian May (Gwilym Lee), drummer Roger Taylor (Ben Hardy), and bassist John Deacon (Joseph Mazzello), and the love of his life Mary Austin (Lucy Boynton). From there, Queen goes from a pub band into something bold and daring. But as fortune favors the bold, Freddie becomes consumed by fame and fortune. Often times losing sight of what got them to where they are in the first place thanks to corporate interference and those within his inner circle who want nothing to do with him but ride on his famous coattails. As the feuds become more heated, we see Freddie’s toxic behavior grow out of control, to a point where he’s ostracized himself. And when he is at his lowest and learns that he’s contracted the HIV virus, he is content to make amends and live out the last days of his life rocking out. Biopics can be a tricky thing. While some biopics focus on certain events or an all-around encompassing life story, Bohemian Rhapsody takes a pretty by the numbers approach and goes for the band’s life with a heavy focus on their frontman. But that isn’t so bad considering that Malek makes for a very compelling Mercury. Though the supporting players had a huge influence on his life, they do the best with the minimal material they are given. But that’s only because this is Mercury’s story. So we get to see him as a person go from a nobody to a legendary rock star. Along the way, we witness a tortured soul being corrupt by corporate interference, bad influences, and ego. And that’s just him. The film also covers the destruction of the band. Although, infighting does tend to come with the territory with any band’s fast rise, it also serves as the driving force for Mercury’s story. And yet, it all feels like clockwork. Bits and pieces of the story fall right on cue. Watching him get into these feuds as he becomes blinded by fame and lost in its allure is a cautionary tale for anyone. And it does reach a point where there are a few eye-roll moments. Even the use of “Under Pressure” at Mercury’s critical and personal juncture is a bit on the cheesy side. Partial lyrics from “Bohemian Rhapsody” seem to hint at Mercury’s internal struggles. These song cues are just a sign of lazy writing. It’s not that Bohemian Rhapsody should twist the facts. But maybe, take things at a different angle and present us a story that doesn’t feel like something we could read off a Wikipedia page. The trouble with these biopics that it is bound to miss some of the critical touchstones of the band or merely skim the surface without bothering to dig any deeper. The film never really bothers to address Mercury’s troubled relationship with his parents. It only gives us these on-cue scenes before moving on to something else. But, there is an upside to all of this. The musical sequences are nothing short of brilliant. In it, Malek becomes Mercury. So much so it is difficult to tell the two apart from each other. And you’re likely to get lost in the music with every performance in the film. The historic Live Aid finale is worth the price of admission alone. While Mercury’s transformation into his rock star persona is stunning, all the in-between material only adds heft to his performance: his succumbing to drug use and inability to mature; his struggles with his sexuality; the realization that he has hit a low point in his life as he learns he contracted HIV. These are the moments that make Malek shine. And watching the montage of the band coming together to create “Bohemian Rhapsody” was a thing of beauty. It shows just how experimental the band was and how far they were willing to go to create the next best thing. Of course, the very odd song did not sit well with some music execs. Here we get to see Mike Myers turn in a very hilarious performance as EMI executive Ray Foster. Only thing is, you may not notice he was in the movie to begin with without the on-screen credit he gets at the beginning of the film. The lighting, hiding behind a wisp of cigarette smoke, and performance alone makes it hard to believe that is Myers. Unfortunately, he only plays a small part in Queen’s rise to glory. That being said, it’s hard not to enjoy those juicy parts. Bohemian Rhapsody, for all its flaws, does a grand job of celebrating the music of Queen. Some of the music has become synonymous with sports. Other times they have been used to set the tone for other films. But just as legendary as their music continues to be, Mercury’s story leaves an everlasting impact. Malek’s performance is not only solid, it’s damn near perfect. So perfect that he quite literally becomes Freddie Mercury. Adding the wonderful energized musical sequences, and it is just enough to overlook some of the film’s tonal issues and predictability.